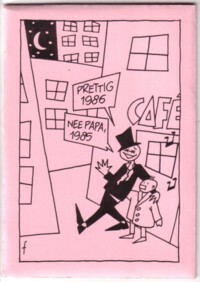 I started making zerox zines in 1977, after I read about this phenomenon in Furore, a magazine that was made by Piet Schreuders. I must have made at least 100 different zines since then, on all kind of topics. Some of these zines lasted only a few issues, others are alive up to this day. 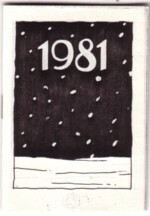 The first issues of the X-Mas zine were about the X-Mas cards, that I designed for other people. That used to be one of the jobs I did. For years I also organised that these cards were printed, which was very expensive in those days. In theory I needed about six people who participated to get two cards printed for free, which I could then use for myself. In reality it never worked that way. There were always people that didn’t pay or made so much problems that I didn’t want them to participate. I wrote all these stories down in a zine that was sent around as a Christmas-zine, including all the cards that were made that year. Later issues of the zine were about the Christmas cards that I received. Because I work for comic publishers and happen to know many comic artists, I used to get beautiful Christmas cards. But there were also other Xmas zines, about other Christmas related projects that I was involved in. It is not interesting enough to go into detail about all this, I just wanted to tell you that making fanzines is an important part of my life. Of course, I also received tonloads of zines from other people. I have given away almost all of these zines to Het Kleine Blaadjes Museum in Eeklo, so I don’t have much to show you anymore, but I will do my best to find the stuff that I kept, before the year is over. Of course, some people send Christmas tapes in stead of zines. One of them was Hans Buying. He and his wife, Miriam van Velthoven, run a successful comic advertisement agency, Comic House. I do occasional letterings for them and they always are the first to send a Christmas something. 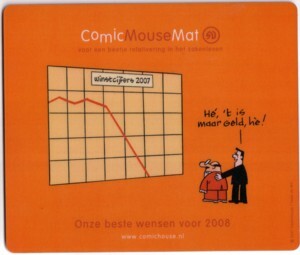 Last year I got a set of postcards, this year a Comic Mouse Mat. But many years ago I got a tape on which Hans sang a Christmas song, that he had written himself. He used to play stand up bass in a band back than, but I think that this is the only song he ever recorded. I remember well how impressed I was to hear that he had done this. 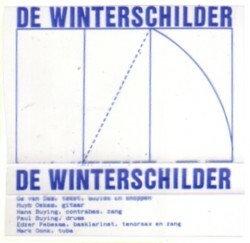 Here is De winterschilder .